Naval Radio Station Chimo, call sign CFI, was established in 1948 about 50 km from Ungava Bay, Quebec at 58.1° N, 68.3° W. Chimo borrowed its name from the village of Fort Chimo which was originally part of the Hudson's Bay Trading Company in the 1800's. Chimo is a mispronunciation of the phrase saimuk, 'Let's shake hands!' Early fur traders were often welcomed with this phrase which they eventually adopted as the name of the trading post. 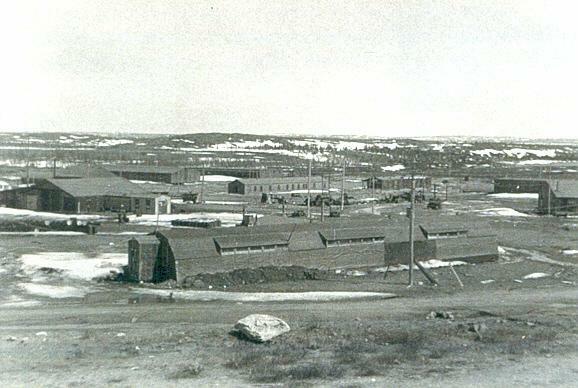 Today, Fort Chimo is known as Kuujjuaq which is the largest community in Nunavik, Quebec's arctic region. In its heyday, the name of the base was pronounced with a hard I as in CH-AYE-MO - not shee-MO as we hear it today. Chimo was established at a former air base base called Crystal 1. This was part of the U.S. Crimson Project launched in 1942. Crystal 2 was located at Frobisher Bay and Crystal 3 at Padloping Island (eastern Baffin Island) both in the former NWT now called Nunavut Territory. The Crimson Route was a set of joint United States and Canadian transport routes planned for ferrying planes and material from North America to Europe during World War II. The project was ended in 1943 and never fully developed. Construction of DF facilities began in 1948 with operations commencing in 1949. Also in 1948, a Catholic mission was established, followed by a nursing station, a school and a weather station. In 1950, the RCN and the USN formally agreed to coordinate and standardize HF/DF activities ashore. Jointly, it was called the Atlantic HF/DF Network and Chimo was part of it. 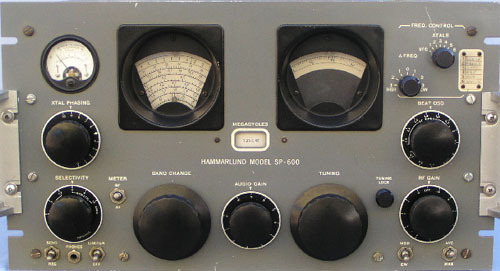 The station was also part of the Canadian SUPRAD system ( Supplementary Radio ). In its simplest form, a SUPRAD station operated in the following manner. When a prospective target made an emission which was heard by the Control Center, Control "flashed" the details of the emission (frequency and call sign) to the SUPRAD stations of the network. The stations tuned the signal, took bearings then reported the bearing to Control. At Control, the bearings were collated by computer and a fix area established. Chimo was a tender to Gloucester, as was Gander, Aklavik, Masset, Bermuda and Frobisher. None of them had an official badge, at least while they were tenders. The cap tallies at Chimo read as HMC Radio Station. Gloucester provided all the administrative functions, pay etc, in its capacity as home to the Senior Officer, Supplementary Radio System (SOSRS). In actual fact, SOSRS was also the Commanding Officer of HMC NRS Gloucester which became HMCS Gloucester in 1953. 1949 to 1950 - Jim (Creed) Baker, LS Malcom "Mac" Feely, PO George Castle and LS William Paly. 1950 - AB Don Corkery and LS Lloyd Zwicker. 1951 - OS John Murison, Ron Maclellan, Robert Collins and Harold Zink. Jan. 1952 - Chief L. Matthews. Bryce Eckstein retired as a Chief then became an announcer with CBC Regina after working as an announcer at radio CHAK, Inuvik, NWT. 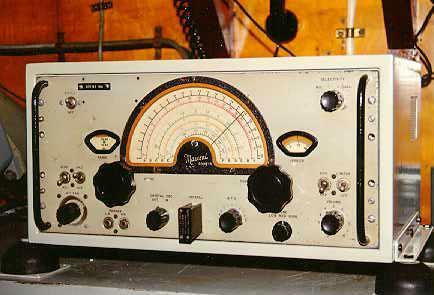 He was also an amateur radio operator, call sign VE5EK, but now a silent key. John Murison remembers how he received his posting to Chimo. " I was in Gloucester (School for Communicator Supplementary Branch) taking my Group 1 and 2 course along with classmates Bob Collins, Ron Maclellan and Harry Zink They kept hinting that Chimo was the posting of choice. Typically, when courses were completed, radiomen were given three choices for the draft location. The four of us, too smart for our own good , decided that we would never be sent to our first draft choice so we picked Chimo. To our astonishment, we were on our way to Fort Chimo in the spring of 1951". John goes on to describe some aspects of life at the base. "The DOT had a contract with the the navy to provide food and quarters for the naval personnel stationed in Chimo. Unfortunately, the DOT did not deliver as they should have. We were shown a building with 5 bedrooms, a bathroom and a small relaxation room with a layer of mud on the floor from one end to the other. Since the USAF had a nearby presence and resources were bountiful, we were able to scrounge from them thus ending up with comfortable quarters. Additional equipment details provided below the table. 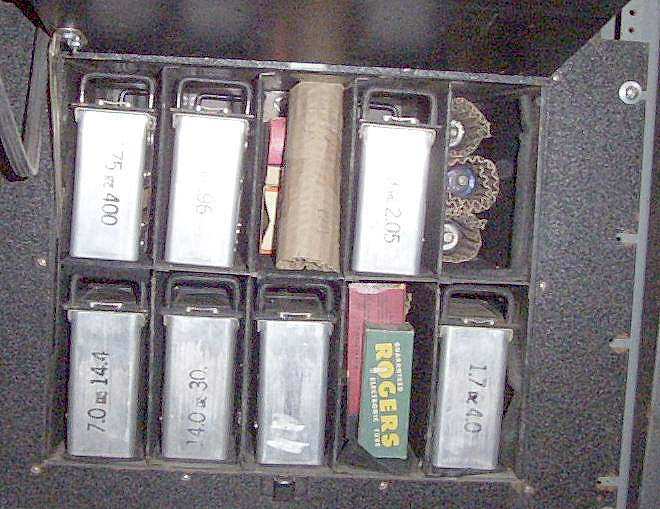 This was a 9 tube set which used 9 plug in coil sets to cover the frequency range of 50 to 400 kc and from 480 to 30,000 kc. IF frequency was 456 kcs and the receiver required an external power unit . A complete installation consisting of a receiver, power power unit and coil storage container weighs 66 kg (approx. 145 pounds). Dimensions: 68 inched H x 32 inches wide x 22 inches deep. John Murison recalls those early days at the base. 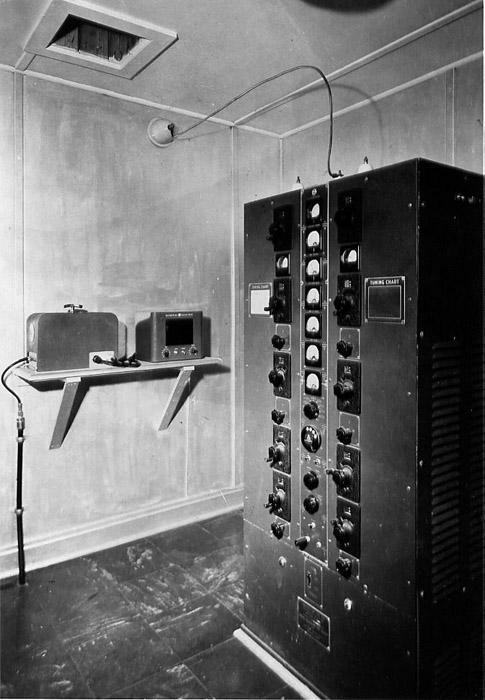 "When we got to Chimo, the RCA AT-3 transmitter and crypto equipment were already installed in the Department of Transport (DOT) building. Because there wasn't enough room in the DOT building for the additional personnel, we split the people into two other buildings called #1 and #2. Radiomen Castle, Paly, Zwicker and Corkery were lodged in Building 1. Murison, Collins, Zink and Maclellan settled in their quarters in Building 2. For security reasons, we moved the AT-3 transmitter, the crypto gear and the offices into Building 1. For receiving at Building #1, we used a Beverage antenna but jury-rigged a temporary dipole antenna for transmitting. There was also a requirement for a link between the the D/F shack and Building #1 order to send the D/F flash reports and key the transmitter. Having the transmitter in Building #1 was not the best arrangement so we tried to find an alternate location but first we needed to erect a permanent transmitting antenna. There was also a plan to set up a northern net with Chimo as the Control but it never materialized. Some 30 foot long poles were located and an attempt was made to erect them but the permafrost prevented us from digging holes deep enough to keep them standing up. Unfortunately we didn't have the heavy equipment that Americans used when they were there. Next, we looked at an unused American building which housed a powerful transmitter. The structure was one mile beyond the end of the USAF main runway and the Control Tower. 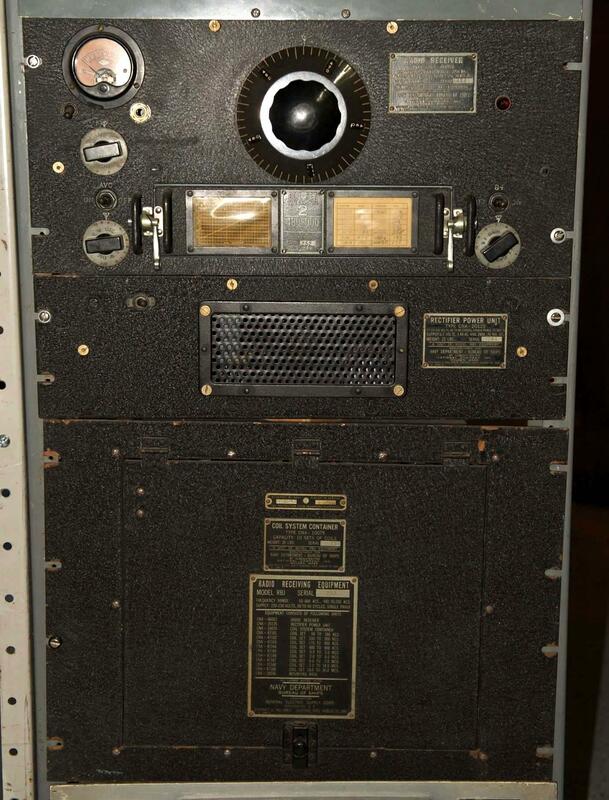 Inside was a 5,000 watt , five channel, radioteletype transmitter that was still in operating order. The poles to support the antenna feed lines were still in place so we proceeded to rig our own antenna on the the existing poles and move the AT-3 transmitter into the structure. In addition, we set up a keying line from the transmitter building to the D/F shack and retained the coding equipment in Building #1 for security purposes. 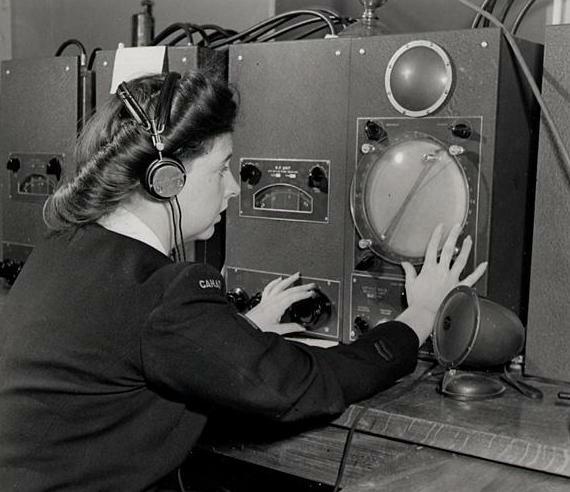 CFH, Halifax had a 24 hour broadcast to ships at sea and to some inland bases. It was simulcast on HF and LF. Traffic was sent to each ship at a scheduled time. Before the traffic was sent, they repeated the ships call sign several times then indicated the number of messages that were going to be sent. It was the duty of the ship to be ready to copy at the scheduled time. If for any reason the operator failed to copy the traffic ( ie poor reception, conditions, equipment outage), one could ask for a repeat broadcast by sending a message to CFH on a different frequency which was set up for that purpose. CFH frowned on requests for retransmission since it was time consuming and was considered bad form. 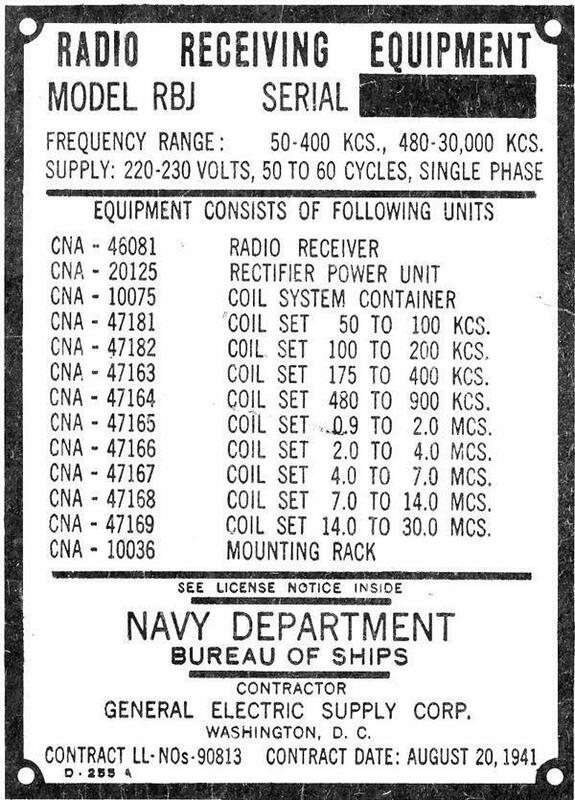 For purposes of communicating with CFH, Chimo was assigned call sign CGQZ, the same format as a ship's call sign for in that period, CFH would only communicate with ships. 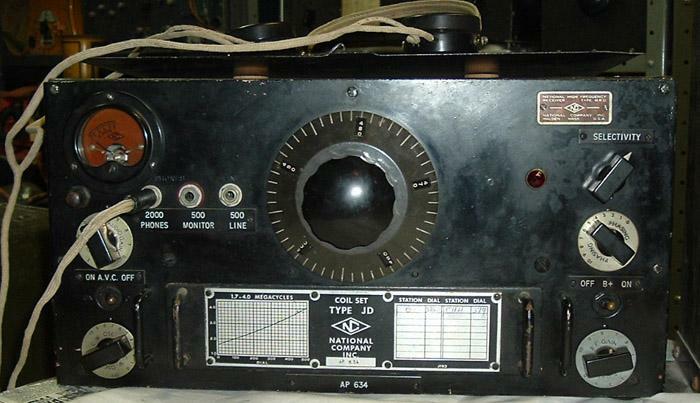 Due to the fact we were junior operators and lacking experience, we installed the Marconi CSR-5 and National N-RBJ receivers in the transmitter building shack and the National HRO receiver in Building 1 in order to copy the broadcast. There were three reasons for this setup. 1) As junior operators we had a problem with the transmission speed that CFH used. CFH transmitted at 30 wpm which was fine for plain language but became a bit troublesome when it came to five letter cipher groups especially if one's Morse was not up to speed. Four of us arrived in Chimo with only a smidgen of training for our SRS (Supplementary Radio Station Personnel) duties and we not only worked our shift at the D/F shack we took care of our own quarters, our vehicles, our equipment and the many others things involved for our own welfare. For that reason we left the CFH duties to our senior personnel until we acquired the skills we needed to do it by ourselves. 2) There was always one person in Building 1 that could copy fast code, therefore he provided a backup copy using the HRO receiver in case we missed anything. 3) By having the HF and LF receivers in the transmitter shack, the operator could select the one which provided the strongest signal and comfortable receiving speed. We only needed to be present in the transmitter shack to receive the broadcast at the appointed time. A dipole antenna was also installed from the top of the D/Fshack to a power pole in order that we could use the Hammarlund SP-600 to listen to the "flashes" and to the frequencies that were used to report our findings after we had received a flash. Two operators were assigned per watch. 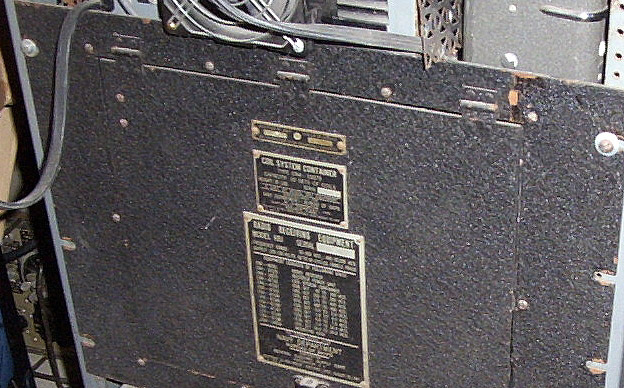 The intercom (part of the CNF-4) between the D/F shack and Building #1 was not used because all of our operational duties were confined to the D/F shack itself. We had a telephone line between the four navy buildings but it wasn't a secure system so we couldn't use it for anything other than non-secure conversations. If requested we could use the SP-600 or CSR-5 receivers to monitor distress frequencies or special aircraft flights or Search and Rescue assignments. At Chimo the builders had to burn off a mossy substance before they could lay the ground mat at the DF site. Once laid, it is believed that a chemical was applied to the area so the moss wouldn't grow up through the mat. We had to repair the mat frequently because moose would wander through the site and break all the joints." Because summers are short and winter is long at that latitude, we had a lot to do in the short interval when the weather was favourable. After working the regular shifts at the D/F shack, we did other work during off times. A short time after our posting, the icebreaker C.D Howe arrived with 200 drums of oil, a jeep and trailer and an 18 passenger Bombardier snow mobile. The Howe was the largest icebreaker that Canada had at the time. Every year, she travelled into the Arctic with supplies for Northern outposts and Hudson's Bay Company stores. The ship was big enough to carry heavy equipment such as bulldozers and trucks. Aside from her duties as a supply ship , the Howe brought in medical staff to administer to the health needs of the natives, judiciary for pending trials, scientists for research and the best crew available in light of her responsibilities as the "ship of the north". She was to big to enter the Koksoak river so she would lay up in Ungava Bay and offload Chimo's supplies unto barges and Peterhead boats. Peterhead boats were used in the northern seas off Scotland and were designed to carry heavy loads of fish in bad weather and rough water. This type of vessel was very suited for the Koksoak River, where conditions could get treacherous at times. The Inuit people could actually order them through the Hudson Bay Company and there were three of them in Chimo. When the Peterhead boats docked at Fort Chimo, the men sat on the rocks while the women unloaded them. The arrival of the icebreaker was a big event indeed"
For utility and maintenance, the base was equipped with a 1949 civilian Jeep Station Wagon which was later replaced by a 1951 Army Jeep with trailer and a 1951, Bombardier C-18 Snowmobile. This was a prototype vehicle made for the Canadian Armed Forces. Powered with a 350 hp engine, and fitted with an interior heater, it would provide decent comfort for up to 18 passengers. John Murison recalls two experiences relating to the base in general. "In January 1952, the Canadian Army conducted an exercise called "Sundog 2" . It was a simulated attack on the base between the "Van Doos" (Royal 22nd Regiment) and the" RCR's" (Royal Canadian Regiment). The Van Doos landed at the base in gliders and assumed the role of "holding" troops while the 'RCR's" were dropped by parachute as the attacking force. Twelve DC3's were used to ferry the paratroopers. It was exciting for us to watch even though we were not directly involved in the exercise. In the previous summer, experimental ration packs were shipped to Chimo via the C.D. Howe, icebreaker-supply ship. During the exercise, these were consumed by the troops participating in Sundog 2 but after the exercise was over, there was an excess of some 200 packs. The Department Of Transport was responsible for the storage of the rations and asked if they could have the use of the RCN jeep and trailer. The intent was to transport the rations to a building where they would stored under lock and key until the icebreaker picked them on her next trip the following spring. Our jeep went nowhere without a navy driver and while the rations were being stored, the driver unlocked one of the windows in the building. Up to now our main menu was a monotonous cycle of Ritz Biscuits and Spam or tuna. The rations packs had virtually everything in them - canned steaks, onions, stew, canned fruits, chocolate, and cigarettes etc. One night when things were quiet, Ron Maclellan and myself took a trip with the jeep and trailer to the storage building and commandeered some of the rations which we then hid in our quarters. Suffice to say, we ate well for the rest of our stay in Chimo". In spite of plans to add 12 additional operators, the base was closed somewhat abruptly. Due to the difficulty and high cost of servicing this base, it was shut down and the facilities were moved to Frobisher Bay, Baffin Island. After Chimo's closure in late summer 1952, Frobisher assumed call sign CFI when it opened in 1954. For additional details about the functions of a SUPRAD station, please refer to HMCS Coverdale found elsewhere in this web site. Many thanks are extended to John Murison who provided the inspiration and much of the material for the development of this web document. 8) Canadian Warship Names. David. J. Freeman. Vanwell Publishing. St. Catharines, Ont. 10) Michael Maiku, Mayor of Kuujjuaq, Quebec.